Per person, you'll need about 150 to 200 grams of cheese (5 to 7 ounces): one-third Gruyère, one-third Emmenthaler, and one-third Fontina or Vacherin Fribourgeois. Grate or cube the cheeses (it's sometimes easier to cube the softer ones). A food processor fitted with the grating disk works well for this. Rub the fondue pot with the cut sides of the garlic clove. Set the halves aside for another purpose. Dissolve the cornstarch in a few tablespoons of the wine. 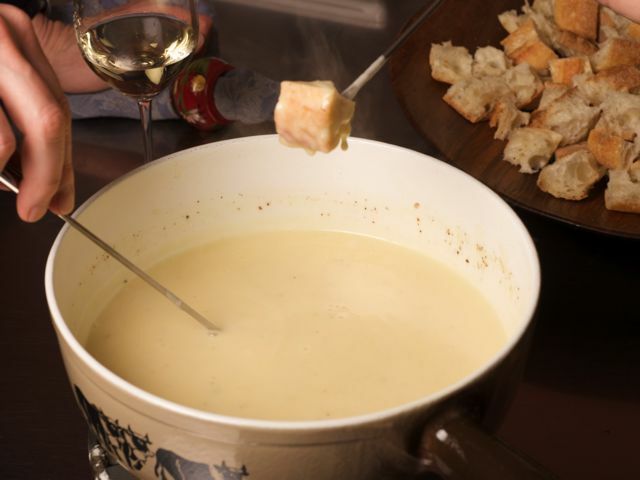 Combine the cheese, wine, and dissolved cornstarch in the fondue pot. Place the pot on the stovetop over medium heat (see Note, below). Stir constantly in a figure-8 pattern until the cheese is completely melted. Add the Kirsch, pepper, and nutmeg according to taste. Put the dish on a lit table burner. Spear bread cubes onto fondue forks and swirl the cubes into the cheese mixture. (Swirling the cubes of bread keeps the cheese evenly melted and coats the cubes nicely.) Eat immediately. When all the liquid cheese is gone, remove the pan from the heat and gently remove the cheese crust at the bottom of the pan. (Don't wait too long to do this, as the crust will get dark and bitter.) Eat the crust; it's a delicacy. If you don't have a stovetop-safe fondue pot — say, for example, you have an electric fondue pot — make the fondue in a heavy-bottomed saucepan on the stovetop and transfer the finished fondue to a prewarmed fondue pot for serving. If the fondue is too thick, increase the flame on the table burner and add some white wine. If the fondue is too thin, increase the flame and dissolve a little cornstarch in wine or Kirsch and stir it into the cheese. If the fondue separates, dissolve a tablespoon of cornstarch in wine; return it to the stovetop over medium heat, and stir. Add a few drops of lemon juice. Always wash fondue dishes in very cold water, as the cheese comes off faster.